Do adults learn in the same way as their younger counterparts? Or do they need their own special approach to absorb the information? In this article, I'll share 5 key elements that every eLearning course targeting adult learners should have. The human brain adapts as we get older. It’s physically larger, which means it can absorb and retain more information. It can also process more complex concepts than a younger mind. However, the adult mind isn’t as malleable as the brain of a child. Adult learners have become biased by their life experiences, perspectives, opinions, and belief systems. Teaching an old dog new tricks requires some very specific elements and techniques, including the effective use of language, context, structure and technology. This may seem pretty straightforward, but it’s an element that is very easy to overlook. Depending on who your online learners are, you need to factor in how they will access the online training resources. Will you supply them with laptops and tablets, or will you create an app they can download? Are they high-income earners with multiple devices or wage workers with limited technology? Are you teaching in a cosmopolitan area or a remote region that may not have constant electricity? Do they have regular access to the Internet? It's best to structure your eLearning course in such a way that adult learners can periodically download eLearning materials. You should also consider a responsive design tool that deploys multiplatform-friendly eLearning content. Adult learners approach education with different points of view. They might be empty-nesters passing time, or retirees pursuing a life-long dream. They might be successful professionals who want to expand their skills and know-how, or disinterested team members filling out their mandatory training quota. A good way to motivate all these different demographics is to make eLearning fun. Incorporate a competitive element and include some playful gamification elements to retain their interest. Divide your eLearning course into modules with a mini-reward at the end of each section. This way adult learners are fueled by their sense of personal achievement. Children go to school because they have to. They are taught that kids go to school and grown-ups go to work. That is the natural order of things. They usually aren’t given the opportunity to explore the "why" behind educational pursuits. For adults, online training must have a practical purpose. They will often wonder if this is something they can use in their career, or apply in their daily lives. If they start the eLearning course and feel it has no direct function, they are very likely to drop out. The structure of eLearning courses for adult learners must therefore include consistent links to the day-to-day life of adult learners. As part of the eLearning content, include anecdotes and ways in which adult learners can use their newly acquired knowledge. Give practical examples of concrete situations of how your eLearning course may come into play outside the virtual classroom. Create closed social media groups where adult learners can offer tips, tricks, and insights. These are also great resource-sharing platforms, as adult learners are able to post links and self-generated eLearning content for the betterment of their peers. Post a weekly prompt or question, then invite adult learners to share their unique perspectives. You can also opt for blogging platforms, or even encourage your adult learners to start their own online discussions. It's best to create community guidelines so that the conversation stays on topic. Host a monthly webinar that focuses on a single learning objective or topic. Send out evites in advance, along with an agenda that highlights the main discussion points and benefits. Adult learners are able to quickly determine if the event is right for them or if they should pass and wait for the next webinar that focuses on their goals or challenges. Some adults dropped out of school in their early years because they felt inadequate. Their circumstances may have left them feeling incapable of learning, and they carried this attitude into adulthood. Other adult learners are born academics with multiple degrees. Learning is something so easy for them that it may even become boring or tedious. The beauty of eLearning is that a single eLearning course can be tailored to individual learning levels. For more engaged or experienced adult learners, give them tougher morsels to chew. For under-confident adult learners, start them slow and build them up. Include simple metrics so that every adult learner can watch themselves move from one level to the next. Brighter adult learners stay interested, and weaker adult learners feel validated. Start with your basic eLearning material, then sub-section it into graded levels. You must approach adults on their level. They need to feel respected, and they need to feel that you have something to offer them. Give your adult learners tools they can use and motivate them on a personal level. Contextualize online training materials in a practical way, create collaborative situations, and infuse trackable challenges into the eLearning course. Including these five elements will greatly boost the success of your eLearning course. Are you interested in learning more about how to create eLearning courses for Adult Learners? 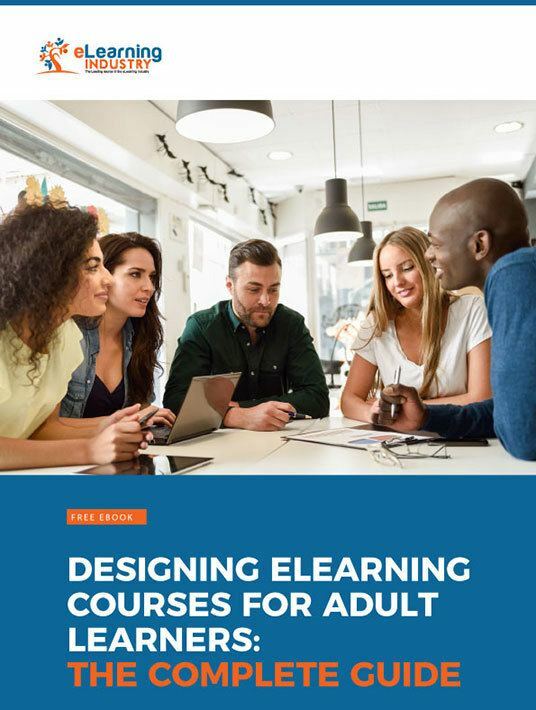 Download our free eBook Designing eLearning Courses For Adult Learners: The Complete Guide to learn about the characteristics of adult learners, what motivates them, the most appropriate Instructional Design models and Theories for adult learners, as well as additional facts and stats you need to know about this particular audience.